I recently visited Sbragia Winery in the Dry Creek Valley. The highlight of the day was a long discussion of wine history and wine philosophy with owner Ed Sbragia. He is in his mid 60's and has a great track record as the head of winemaking at Beringer Winery for more than 25 years. This by itself shows his desire for quality when you look at the wines he has crafted for Beringer. Their signature high end bottlings of Chardonnay and Cabernet rank consistently with the best of Napa Wineries. Ed is currently an ambassador for the Beringer label and often speaks and travels on their behalf. He is a walking encyclopedia of information dating back to his early tenure with Myron Nightengale and Andre Tchelistcheff. 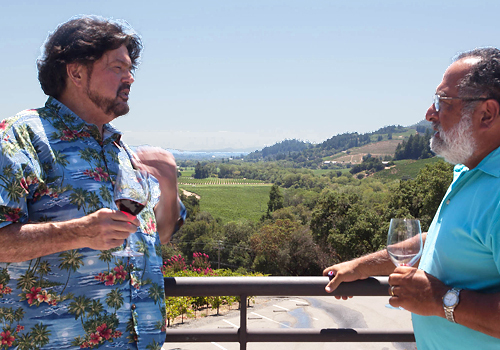 In 2002 Ed Sbragia started his own family winery and focused on fruit mostly from the Sonoma Appellation. The Beringer people were supportive of his effort and allowed him to work on his own label as well as work with the Napa producer. He and his family own a small sector of vineyards. He looks for others that produce high quality fruit which express their site specific traits. Many of these sites have stories behind them which makes them even more interesting. Ed is committed to nurturing the land and keeping it as healthy as possible with natural ingredients. Sbragia has a current capacity of 11,000 cases annually subject to the whims of mother nature. The winery itself sits at the end of Dry Creek Valley high enough so that you get a perfect view of the entire valley and a back drop of the Dry Creek Dam which prevents the valley from flooding as it did in the early 1930's. Ed tells the story of his mother wanting to sell their low level vineyard for higher ground after a flood left standing water in their home at knee level not to mention the vineyards which were under water. There are some informative photos of the flood and other businesses that existed during that period at the winery. Ed is often in residence and loves talking wine and the history of his family and their start in wine growing and production. Once you meet him you will be exposed to the knowledge of a nice man and great wine maker. The following is a run down of the current wines available at the winery. '09 Gamble Ranch Napa Chardonnay. 92 pts. from Wine Advocate and a round, full palate of flavors. Pear and pineapple with a mid-core of French oak to draw out a beautiful glass of wine. '09 Home Ranch Dry Creek Chardonnay. 92 WA and 91 Spectator. Less than $30 a bottle and tastes so much more expensive. Apricot, honeysuckle and pear make this wine a winner for all sorts of food. Extremely well made. '11 Gino's Zin comes home with 14.4% alcohol and tastes very smooth and balanced with typical Dry Creek intensity. Planted in 1957; you get the benefit of fruit from vines almost 60 years old. Rich in berry fruit with mild tannins that will reward aging for 10 years plus. '11 La Promessa Zin Dry Creek. This wine checks in with 15.8% alcohol but does not show it in the nose or palate. My favorite of the Zins tasted. Rich and balanced with a bit of earth and stone to compliment the wide array of berries and tannins. Winery and wine club only. '07 Monte Rosso Cabernet Sonoma Valley. Rated in the top 100 by S.F. Chronicle. Ed gets this fruit from a long term relationship with Mike Martini who also happens to play in their band Private Reserve. This is serious and complex Cabernet with mountain fruit and rich tannins that bring out a wine which is only grown at Monte Rosso. The winery is selling this vintage because they are sold out of the more current vintages. This goes to show the high quality of the vineyard and the wine making. '09 Rancho Del Oso Howell Mountain Cabernet. 92 WS, 93 WA. This is a mix of power and grace from mountain fruit and carries 15.5% alcohol. Howell Mountain can bring out the wild side of Cabernet and this wine shows what comes from hill side grapes which strive to find water and produce a crop of high intensity wine. Not for the feint of heart but very rewarding. '09 Wall Vineyard Mr. Veeder Cabernet. 93 WA, 91 WS. This is another mountainside vineyard which required two years in new French oak to come together. While so good now it is still quite young and will reward a few more years in the cellar to round out all of its complex flavors. A visit to Sbragia winery should be on the list of any serious consumer of fine wine. More often than not you can meet the owner and share a glass of his top shelf wines. Ed said that wine is made to be consumed and he is proof positive that wine is part of the good life.